With the attempts at eating only animal based meals, the one thing I’m curious about is my training. Working out is my happy place. I typically workout M – F at 5 am. I go to CrossFit Continuum 4 of the 5 days per week and recently have been adding a pure meat head strength day into the mix at a local globo gym. I’m a little guy, I want to get stronger. Prior to animal based August, my carb intake was averaging 85 grams of carbs per day. Obviously that is going to be much, much lower this month. A tool I’m using to help guide my training is heart rate variably. I use an app called Elite HRV and have recently switched from a chest strap heart rate monitor to their finger sensor. Still new to the finger sensor device, I wasn’t confident in the results this morning. It told me I needed to back off on training today. I went to the gym anyway with anticipations of completing a 2,000 meter row, 1 mile run, and finish with anther 2,000 meter row. I warmed up, everything was feeling good. I got to about 1500 meters of the first row and just bonked. I finished the 2,000 meters but then called it a day. So the monitor was right. Analytics can be useful. I’m sure I will adapt to the new diet within a week or 2 but I will keep monitoring with HRV to help guide my training so I train smart. HRV is NOT Heart Rate. Heart Rate Variability (HRV) is an accurate, non-invasive measure of the Autonomic Nervous System (ANS) – which responds to everything: how you exercise, recover, eat, sleep and perceive stress. Unlike basic heart rate (HR) that counts the number of heartbeats per minute, HRV looks much closer at the exact changes in time between successive heartbeats (also called inter-beat intervals, RR intervals, NN intervals, etc). The Sympathetic Nervous System controls your body’s “fight or flight” reactions in response to internal or external stressors. It stimulates blood glucose (to fuel your muscles), pupil dilation (to see tigers better), slows digestion/peristalsis (to focus energy on the present danger), and increases heart rate (to ensure adequate blood circulation to run or fight). The SNS is ideally activated to overcome short term stress situations such as running from a tiger or fighting an intruder. But this same response also occurs when you exercise, perform challenging mental tasks, get into an argument, or even launch a Kickstarter :). The Parasympathetic Nervous System controls your body’s “rest and digest” responses and is associated with recovery. Parasympathetic activation conserves energy, constricts pupils, aids digestion, and slows heart rate. The PSNS is meant to help build for the long term and is needed to grow faster, stronger, and healthier. The SNS and PSNS control the same organs with opposite effects. Both branches are always working and both are needed to maintain homeostasis (balance or equilibrium) in your body. With every single heartbeat, your nervous system is saying “slow down – speed up” based on feedback from all your senses, emotions, etc. A healthy nervous system has a balanced but strong push and pull between the Sympathetic and Parasympathetic branches. Heart Rate Variability is an accurate, non-invasive measure of the ANS and the balance between the SNS and PSNS branches. The Sympathetic Nervous System’s physiological response to stress focuses on short term survival in lieu of long term health. This acute response can become chronic (constant, long term) in the presence of stress from modern daily life such as work, relationships, financial, environmental, dietary, physical, lifestyle choices, etc. Chronically accumulated stress from multiple sources can all contribute to drastically reduced health and performance over the long term. Now that you can accurately and conveniently track your nervous system, you can make better health, training, and recovery decisions to reach your goals. 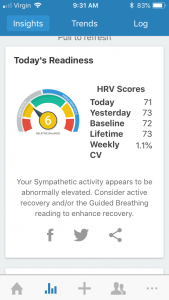 What Do HRV Scores Mean? Luckily, we make analyzing and understanding your HRV score easy. The app lets you tag your HRV measurements with the important things going on in your life and then helps you analysis the results and provides daily HRV-based guidance. To continue to learn about the science of HRV and how people are successfully applying in their lives, see our blog posts, podcasts, and recommended resources. The best way to learn more about HRV is to download the free app from the App Store or Play Store and start using it to achieve your goals. How to Get Your Kids to Eat Vegetables.